Their pout is natural as the uneven texture of the cork they are created from. They gaze away as if in flight. Their allure is beautifully elusive. Out of the reach of mortal man. Sailors would claimed they had seen their voluptuous bodies lying on shores. Had these courageous and adventurous men indeed seen beautiful women with a woman's upper torso and the body of a fish? Or had they in fact seen a vision of a silky siren as an illusion in a great walrus? Who knows. 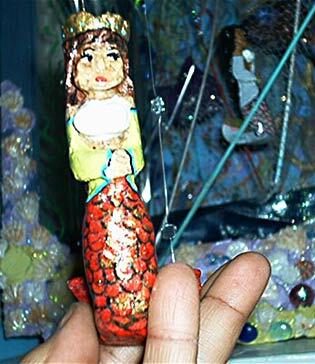 There are many tales about mermaids and mermen and their existence throughout history. What story would you believe? * My multicultural ladies are humbly elegant, mysterious, magical and waiting to join your family. * No two of them are alike.